With more patients using the internet to search for their healthcare provider, your internet presence is becoming more important than ever. Do you have great reviews on Yelp and Healthgrades? Do you have a website that is user-friendly? Are you visible on search engines? A robust medical marketing plan may be what the doctor ordered! By using innovative medical marketing techniques, GMR Web Team is here to help you bring your healthcare practice to the next level. We are a full-service medical marketing agency that helps you develop a strong online presence to improve your patient experience and acquire more patients. From premier web development to patient acquisition marketing to reputation management, our online medical marketing services work together to help you understand your patient's’ needs and create a loyal network of new patients. It’s important that a website engages patients and showcases your healthcare brand. We pride ourselves in building content-driven, responsive websites that do just that. With us, your website will be mobile friendly and relevant to your patients. We make your vision come to life and provide innovative development solutions for any of your needs. We create a customized medical marketing strategy for your specific needs. We make your online presence known, keep your patients engaged, and show why your practice is heads above the rest. One of the first things patients see when they search your practice online is your reputation. 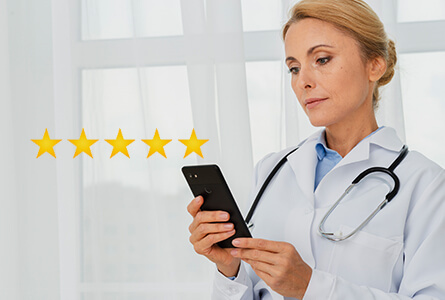 More patients are looking up reviews for your practice before they even think of making an appointment. We developed a proprietary software that effectively manages your online reputation, so it accurately reflects your practice.